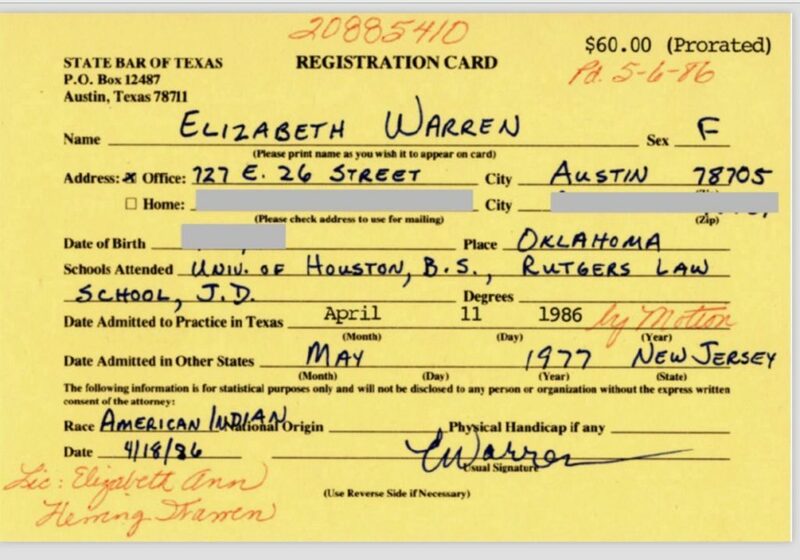 Sen Elizabeth Warren is having a bad day today after her Texas State Bar registration card surfaced showing she identified as “American Indian”. (Btw don’t “native” Americans consider being called “Indian” offensive?). That bar registration is in fact needed to get a job as an attorney! So Warren has not only lied about her “native American” heritage, but also using it to in fact get ahead! Will the left call Fauxcahontas out over her cultural appropriation to advance her career or do those rules only apply if it’s a republican / conservative? Warren is a fraud who will do and say whatever she has to get ahead and advance she and the democrat party’s anti-American progressive agenda.